Halloween hand puppets are fantastic learning tools for preschoolers and other young children. This no-sew ghost puppet is easy and fun to make. Be sure to also check out these Halloween activities for preschoolers! 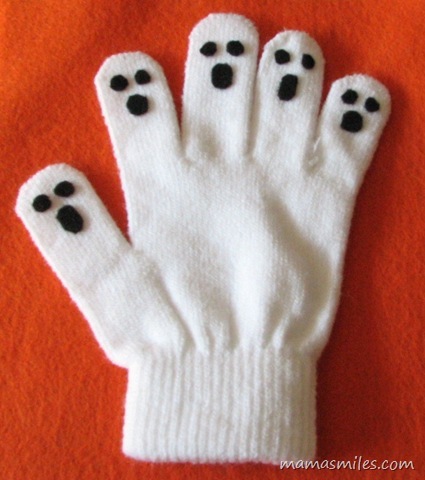 This no-sew ghost hand puppet is very easy to make, and it has been a huge hit with my kids and their friends! It makes a fun quick and easy Halloween craft, and it is a wonderful storytelling tool as well. Pair it with the picture book Five Little Ghosts for a fun preschool or toddler activity! Cut ten small black circles and five slightly larger black ovals out of black felt. The circles will be the ghosts’ eyes, and the ovals will be their mouths. My “circles” were actually squares and rectangles with the corners trimmed off. Glue the circles and ovals on using craft glue. I found it was easiest to put a small amount of craft glue on a dish and to apply it to the small felt pieces using a toothpick. Let dry and enjoy. Our adult-sized stretchy gloves were small enough that Emma could get her fingers far enough into the glove to use this as a puppet. If you can’t track down a copy of Five Little Ghosts, I found two different “Five Little Ghosts” rhymes that could be used with this puppet here and here. We will turn the other glove to turn into snowmen in a couple months. Do you have an easy and fun Halloween activity that my kids would enjoy? How about some more fun Halloween hand puppets for us to make? Please let me know by leaving a link or message on my Facebook Page! You can also tag me on Instagram. Oh my gosh, those are too cute!! I just saw some white and black ones at the store today… if only I had read this first!! That is just adorable! I love it! I saw this on Twitter somewhere and wanted you to know I shared it in my Creative Mamas Monday blog hop! :-) Such a cute idea! They are awesome! We will look out for some white gloves! Those are so cute! A very kid-friendly Halloween craft. This is great!! I think we’ll make some of these to add to our special treat bags for friends. I’m so glad you posted this! I love this! Thanks for sharing it. Sorry we didn’t find it in time to add to one of the Halloween posts, but I am so glad that you’ve linked to it! .-= Michelle´s last blog ..Having Fun Learning =-. Could find an orange glove (hunting section) and do faces for pumpkin fingerplay. Pinned it! I will make this for my son AND use it for storytime! Cute and simple, just my style.